Home Modules Module 2 Section 3 What Genetic Services Exist for Children and Families in Canada? In Canada, the Canadian Association of Genetic Counsellors certifies genetic counsellors. There were approximately 269 certified genetic counsellors in Canada in 2009. Alongside these genetic services, there are a number of community-based organizations in Canada that focus on providing support and education to families with a genetic disorder. The Canadian Directory of Genetic Support Groups lists 78 Canadian organizations offering such support. The umbrella organization, Canadian Organization for Rare Disorders ( C.O.R.D.) provides overarching support and advocacy for many genetic disorders. 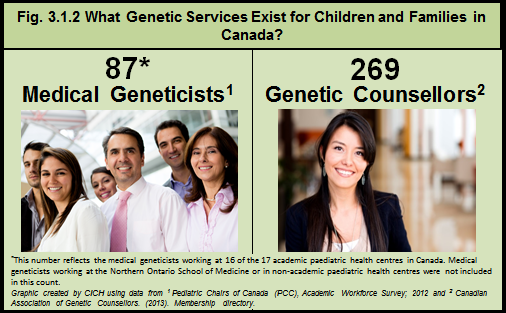 Source: Pediatric Chairs of Canada (PCC), Academic Workforce Survey; 2012, and Canadian Association of Genetic Counsellors. Membership directory. Oakville, Canada: Canadian Association of Genetic Counsellors; 2013.